Her full traditional name – Waseskwan Iskwew – translates as Blue Sky Woman. But iskwē believes she has come from the stars. The Indigenous pop and electronic singer-songwriter originally from Winnipeg is fond of the Cree teaching that we are descendants of the star people – and that shooting stars are spirits passing between worlds. This imagery partly inspires her newest single “Little Star,” which earned a video premiere on Billboard and was a highlight of performance in Montreal February 22. 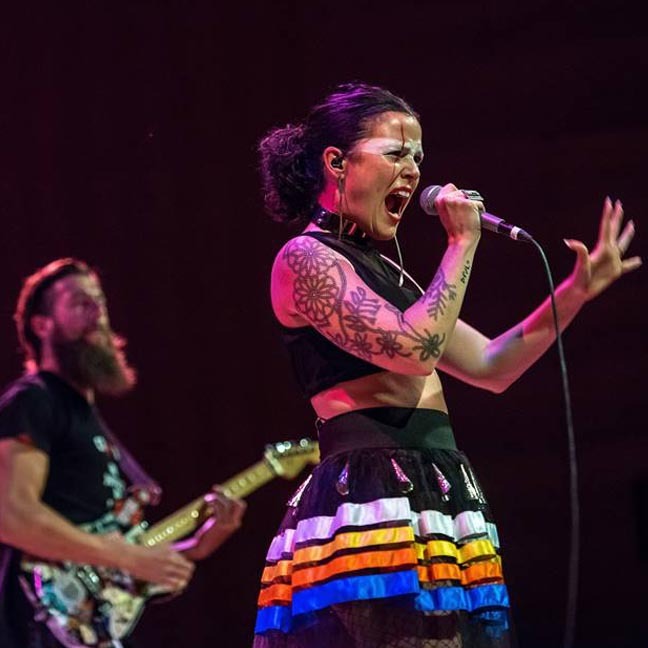 The darker inspiration was the shocking acquittals of the white men accused of killing 22-year-old Colten Boushie and 15-year-old Tina Fontaine, which occurred when iskwē was writing the song at the Banff Centre conservatory. This anthemic tribute to young Indigenous lives lost, which is also a protest at systemic injustice, sparkles with pop sheen but is set to the beat of an Anishinaabe honour song – a juxtaposition representative of her cross-cultural aesthetics and outspoken nature. This was all on full display in Montreal’s intimate venue Le Ministère. Rather than being a confrontational affair, as lyrics like “I won’t let you look away anymore” may suggest, iskwē prefers to let her impressive music do most of the talking. Local Oji-Cree artist Anachnid opened the evening with style, weaving her ethereal vocals over intricate electronic beats and getting the crowd slowly swaying. Anticipation was high by the time iskwē took the stage, backed by a stellar band that take her songs to another level. While her set is anchored by hit anthems, the deeper album cuts and newer songs are no less impressive with their innovative arrangements and intriguing flourishes. The respect iskwē commands from her talented collaborators is evident. Her next album, due later this year, will apparently focus on themes of social justice while highlighting the beauty of Indigenous teachings as a way to nurture empathy and equality. The sound is often hard-hitting yet viscerally seductive, combining her trip-hop, R&B and EDM influences with elements of progressive rock. Some songs from her Juno-nominated (for 2018 Indigenous Album of the Year) sophomore album, The Fight Within, address Indigenous, environmental and women’s issues while others are more inspired by personal relationships. Although iskwē sometimes performs wearing Indigenous regalia and makeup inspired by Dene and Inuit facial tattooing, she was relatively unadorned on this night. Her grandest gesture toward First Nations solidarity came when she invited the crowd closer to the stage to repeat a chant in an Indigenous language. This special moment demonstrated her inherent knack for inclusive communication, which she occasionally employs while teaching art, gender issues and Indigenous culture to students near her adopted home of Hamilton, Ontario. It’s been a long journey to achieving this level of artistic success and self-confidence. She began seriously pursuing a music career following a 2003 audition for Canadian Idol, which took her to New York and Los Angeles before her eponymous debut was released a decade later.